Roughly a decade ago, the US DoD passed the Energy Independence and Security Act, which greatly affected the production of inefficient incandescent lamps. For commercial airports, the new lighting standards forced such establishments to replace outdated lighting sources at runways, high-activity areas and obstruction zones with LEDs. However, due to the complexity of airfield lighting systems and the unpredictable nature of flying large planes, the FAA released several updates to the guidelines, with focus on reducing the intensity of such luminaries (more on this later). Furthermore, the industry is heavily regulated by leading agencies, such as the Federal Aviation Administration (FAA), the US Department of Defense (US DoD), the US Department of Energy (US DoE), the National Business Aviation Association (NBAA) and local government institutions heavily invested in infrastructure projects. This article provides a general overview of airfield lighting systems, the types of lights used to support airport operations and the FAA’s struggle with LED implementation. An integral component of efficient lighting systems is power. In airfields, underground electrical vaults, which house power distribution stations, allocate electricity to lights scattered around the site, using heavy-duty cables. In most cases, because the vaults are inaccessible, the components are monitored and controlled through a remote system located somewhere else on the site. Some airfields leave controls for lighting circuits with air traffic tower operators. For reliable communication, airports rely on fiber optic cables, which are also buried underground. In the event such components are struck, broken or damaged, workers temporarily switch to radio-based communication until the line is fixed. According to the 2014 Edition of the Aeronautical Information Manual, published by the US Department of Transportation and the FAA, airports must be equipped with different types of lights for safety. Generally speaking, FAA guidelines suggest red lights on airfields are used for warnings (sections of the location that are blocked), while green lights indicate the start of the runway. During the approach, pilots rely on white lights that guide the aircraft during landing maneuvers. •	Runway Guidance Lights: Runway Edge Light Systems (HIRL/MIRL/LIRL), Runway End Identifier Lights (REILs), Runway Centerline Lighting System (RCLS), Touchdown Zone Lights (TDZL) and Takeoff Hold Light Array (THL) are examples of such luminaries. Most of these lights emit a white color with specific flashing patterns for identification. Runway Edge Lights and Runway Centerline Lights can incorporate yellow and red colors, as well as different beam intensities, depending on the length of the structure. •	Taxiway Lights: Clearance Bar Lights, Stop Bar Lights, Runway Guard Lights and Edge Lights clearly mark the boundaries of intersections and pathways. These units use blue, green, red or yellow colors. •	Glideslope Indicator Lights: This type of airfield light is applied during approach and landing. Visual Approach Slope Indicators (VASI) include luminaries on the side of pathways, typically consisting of 2-16 lights, evenly allocated over 2-3 bars. Precision Approach Path Indicators (PAPI) are horizontal, red/white fixtures installed on the left side of the pathway. These lights are used to establish the correct flying height during the approach. •	Airport Beacon Lights: Rotating strobe lights can be found throughout the airfield. They are used to mark the height of tall structures in order to prevent collisions for low-flying planes. Commercial airports use green or white for such requirements. Military airports also apply green or white strobes, but also include two additional white lights with every green light for distinction from public airports. Airfields for helicopters incorporate a combination of green, white and yellow. Previously, incandescent and high-intensity discharge (HID) lamps were used for illumination on commercial airfields. In the past decade, aviation authorities and military groups have promoted the application of newer lighting technologies, such as LEDs, to improve airfield lighting systems. According to a white paper published by ADB Airfield Solutions, LEDs present numerous advantages for airports. The report compared the performance of halogen lights and LEDs on airfields. From a cost perspective, energy consumption is reduced by up to 70 percent when switching to LEDs. In a trial that compared the two lighting technologies’ strengths, LEDs required less than one hour of troubleshooting with two technicians, while halogen lights needed up to five hours with a minimum of four technicians. When it comes to lifecycles, halogen units provided up to 1,500 hours of illumination. LEDs offered up to 56,000+ hours, resulting in decreased maintenance and upkeep costs. The FAA and the US DoD (among others) have been very vocal about transitioning from outdated lighting technologies to modern options, such as LEDs. To streamline this phase, the FAA has held several discussions with various aviation groups and industry stakeholders. Moreover, the institution releases periodic memos about updates to aviation lighting standards and practices. As mentioned earlier, one of the major hurdles that the FAA faced during the implementation stages of LEDs is excessive brightness levels. Reports surfaced from the NBAA and the NASA Aviation Safety Reporting System, indicating that LED lights used at commercial runways were noticeably more intense than their predecessors. According to a 2011 report from a licensed, Albuquerque-based pilot, intense LEDs can reduce depth perception and night vision quality, when approaching the runway. In another report, this time covering LEDs at Richmond International Airport in Virginia, a veteran pilot mentioned that the issue with the new lights is that they cannot be dimmed or the lowest brightn ess setting is still visually overpowering. The industry’s concerns surrounding LED implementation is certainly unique, as most businesses find traditional lighting sources to be too dim or dark. To effectively address the aviation sector’s concerns, the FAA announced an update from a three-step regulatory system to a five-step framework, as detailed in Advisory Circular 150/5340-30H and Engineering Brief 67D. The changes enforced re-established dimming curve standards for LEDs (white and colored) on runways and taxiways. After the release of the updates, the agency revealed it has not received new complaints about excessively bright LEDs. For the US military, upgrades to existing airfields go beyond LEDs. According to a 2011 memo released by the US DoD (titled Engineering Technical Letter [ETL] 11-27: Solar Lighting for Airfields), solar-powered luminaries should be used in remote sections of airfields. This solution could reduce time spent on installing underground cables and vaults, as well as decrease costs related to equipment and labor. These lighting systems must meet illumination standards set by the FAA. Point 6.5 in the memo provides insights on preferred configurations for solar-powered LED lights by the agency. Specifically, the US DoD requires solar-powered LED airfield fixtures to consist of integrated panels (not a separate, external panel). The only exception to the application of this standard is obstruction lights. 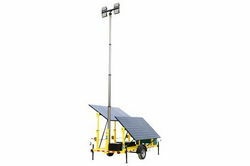 Lastly, solar-powered LED fixtures with internally located, integrated power cells (batteries that cannot be removed and requires the full replacement of the unit during malfunction or failure), are not recommended for airfield lighting systems.